Make sure your logo is on everyone's lips with our sweet and luscious promotional lip balm. Rich with beeswax to help nourish and moisturise the lips. 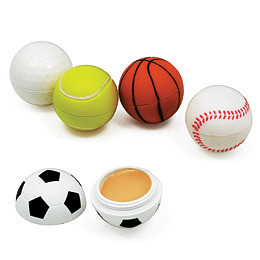 Unique twist top packaging available in five of your favourite sporting balls. All of our promotional lip balm can have natural sunscreens, namely natural zinc oxide and titanium dioxide, added to their formulation for free upon request.